Aaron and I often talk about how we want to teach our kids to be good, KIND people. It's not an easy or obvious thing, teaching kindness and love to small children who are still struggling with sharing and not hitting when they're upset. There are plenty of days when we wonder if we're making any progress at all. Last year a 5th grader at Stinky's school had a stroke and went into a coma. He was a kindergartner at the time and had never met the girl but he was determined to find a way to help her. When the school announced that they were collecting loose change to help the girl's mother with hospital bills, Stinky marched right up to his piggy bank and emptied the whole thing into a heavy duty plastic bag. His backback was extra heavy the next day as he carted that bag to school. He'd been saving for ages and he didn't even think twice about giving up ALL his money to help someone in need. 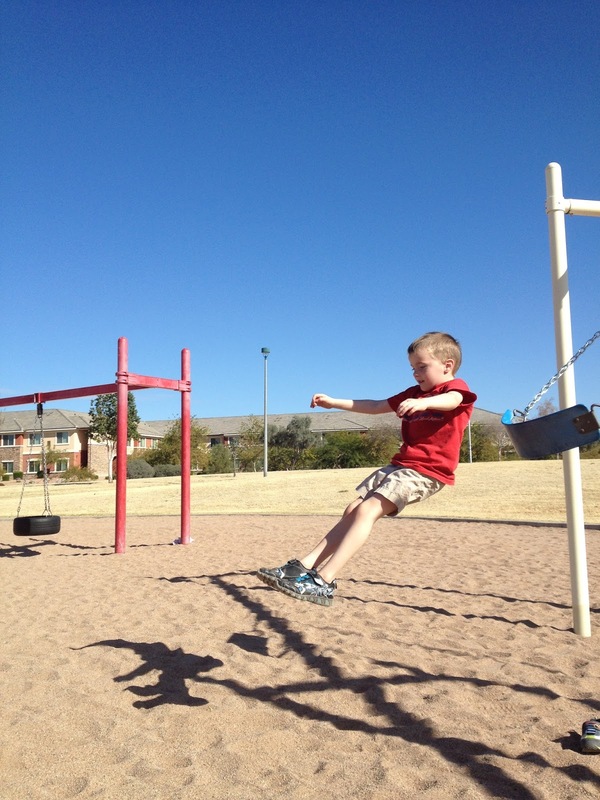 Having fun at the park in new duds from Schoola! Right in the feels, you guys. I've never been more proud. Since then whenever we pass a collection box for Phoenix Children's Hospital he asks for a coin to put in. "For the girl from my school!" It was a horrifically sad situation (last I heard, though, she was doing really well!) but it gave my son the chance to learn that sometimes sad things happen to others and it's up to us to try and help in whatever way we can. I hope he always remembers the way he felt when he turned in that bag of change! Want to help give back to others? Shop for gently used clothing for your kids this year with Schoola! PLUS you can get 20% off your order with the code BacktoSchoola20. Shopping with Schoola provides much needed funds for programs in deserving schools (like Yick Wo in San Francisco) and you get super affordable back-to-school clothes for your kids! I love when shopping gives me warm fuzzies! This post is brought to you by Schoola, the best place to buy discounted kids clothes all while giving back to schools in need. Click here to learn more about Schoola. Click here to see what people are saying. What a sweetheart. Love that. When my son was almost 3, he asked for some pennies to throw in the fountain at the mall. He walked right up to the water and pitched it in, and then proceeded to bawl his eyes out because his penny was gone. I don't think he realized that once he threw it in, he wouldn't be able to get it back. Well, a few months later, our church handed out baby bottles to fill with loose change and turn back in. The money was going to help a crisis pregnancy center. I asked Riley if he would like to put some money from his piggy bank in. He said yes, and then proceeded to give ALL of his money. I was really worried that we would have another meltdown, so I emphasized that he would not be getting this money back. We were going to put it in a box and leave it at church. He said, That's OK, the babies need it, mommy." I was so proud of him. It really hit me that my so called generosity does not even compare to his. Children have so much capacity to love. Oh gosh I love that!!! Plus now I want to jump off a swing! This warms my heart. It's always amazing to see them do the right thing on their own. Even if it is just holding a door open for another person. It's wonderful to see the kindness in our children. This is incredible and you are a wonderful mother for instilling those qualities in your children. My son is almost 5 and I am always trying to teach him about compassion and giving- especially by showing him examples by doing those things myself. They truly leanr by example and you have a wonderful heart! What a great cause! It is so awesome to see kids take initiative and start something wonderful like this. What a sweet guy! I love the heart of a child. They always seem to know how to makes someone's day! Your son is such a sweetheart. I love this cause. It is so great to see something like this for kids! Oh my goodness. Your son is seriously the sweetest little man ever. That is so thoughtful of him and many kids at his age are so not like that. This is so heart warming and helps realize that there are good people out there. There are good parents who are raising their children right. People (I am guilty of it) tend to get so jaded by watching the news and how awful things happen daily. And it is so much worse when kids are also doing horrible things, but this puts things into a new light and helps realize that there is not all bad in the world. Good job on raising such a sweet boy and I am happy that the girl from his school is doing better. Wonderful post!!! I can't wait to be proud of my children like this. I truly hope the little girl is well on the road to recovery. So sad and she would have been so young. I'm glad everyone is helping her mother though. What a darling son. You have so much to be proud of in him, which I am sure you already know! I cannot wait for moments like this when I have children someday. All your hard work is paying off momma! You have raised a sweet, compassionate young boy. I'm sure you will see many more examples of your influence as he grows up. This post hit me in the feels. What a sweet caring boy you have. Oh, what a sweet sweet boy you have. It's amazing how much our children can teach us about selflessness and charity. How lovely! Such a kind and considerate little man you have there. That is the sweetest thing. You sound like you have an amazing little boy on your hands! What a sweet, sweet boy. You are one lucky momma! What a sweet little boy! Glad to hear she's doing better, a stroke in 5th grade... wow. What a sweet little boy! A child's heart is an awesome thing! Glad the little girl is doing better. Having a stroke that young is crazy! My daughter is obsessed with Tripp Halstead- a little boy that was all over the news when he suffered serious brain damage in a freak tree limb accident. She always wants to give her toys to Tripp! Right in the feels f'reals! So so super cute and sweet! Love the action shot! He's got such a good heart at such a young age! you're doing it right! I think it's wonderful Stinky donated all of his money! You and your husband have raised him so well! Aw, what a loving action on his part. I think the best way to teach kids love and kindness is to lead by example. aww, what a sweetheart!! I definitely think that kindness is taught through example, and you are doing a wonderful job! What a sweetheart! Love love love this!